This month I started on the second half of my work with the OER Hub. Building on discussions between Martin Weller, Viv Rolfe and Irwin DeVries, I have been working on developing a timeline of key papers in the history of Open Education. I’m also working through the papers, to tag them with keywords and draw out broader themes (I’m about halfway through this so far, and am sure that my thinking will shift a bit before it is ‘finished’). A draft version can be found online here: http://www.katyjordan.com/opened_draft.html. This month, I’ve started on a short contract to do some work with the wonderful OER Hub. Initially I am working to help populate the OER World Map, which is an online database of all things OER (projects, organisations, events, case studies, resources) pinned to a map of the world. Via Figshare, I’ve published to of the key figures I find myself using frequently in relation to academic social networking sites. Figshare issues Digital Object Identifiers (DOIs) to resources hosted on the site, so if you do find them useful, this is a handy way to cite them. At the moment, I’m doing a lot of writing, catching up on writing up papers from my PhD and other loose ends, and also drafting potential funding bids. It’s going well, but I find that I can’t sit and write non-stop all day. I need little side projects to do a bit of work on for a bit for a break. Something which I’ve had in mind as an interesting side project for a while now is looking at the similarities and differences in pages about MOOCs in different language versions of Wikipedia. Initially, I was going to scrape the references from a sample of pages, and look to see which articles or resources are cited in different versions of Wikipedia. However, I quickly discovered that there isn’t much consistency in referencing – the same article could have a full citation in one version, but just a hyperlink in another, for example. I would also be relying on auto-translation, which adds another bit of uncertainty. I haven’t included labels in the static picture above as there were too many and too long, but the network can be explored in more detail in the interactive version here (opens in a new tab). Again, labels aren’t included here as I haven’t managed to get a good layout with readable labels yet. But the nodes here are scaled according to out-degree, so the domains which are cited more highly are larger. The cluster in the middle represents the most frequently used sites (check out the interactive version for more detail and labels). My initial thoughts on this are that I was surprised that there isn’t a greater amount of overlap; that the online Higher Education media is an important source of information (e.g. The Chronicle has a higher degree than any of the MOOC platforms); and cMOOC thinking also comes through strongly. I’d be very interested to hear your thoughts! 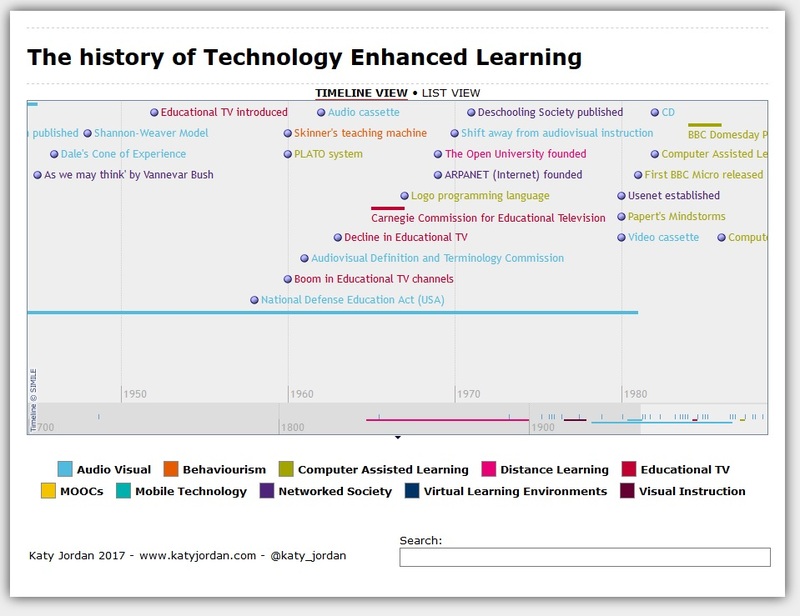 Several years ago, when I was working with the Technology-Enhanced Learning Research Programme, I developed an interactive timeline for the website which set out a brief history of technology-enhanced learning, going back all the way to Victorian correspondence schools. Out of the blue last week I received a message that it was no longer working, and whether I have a static version, as it’s a valuable reference resource. I had almost forgotten about it – the date on the webpage suggests I made it back in 2011 – but I’m glad that folks have found it useful whilst it has been quietly sitting on my website since then. 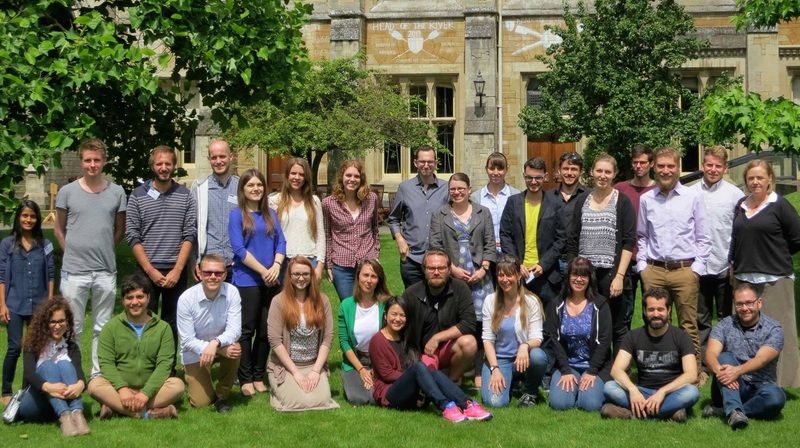 Last year, I realised one of my PhD student ambitions and was fortunately able to take part in the summer doctoral programme offered each year by the Oxford Internet Institute. 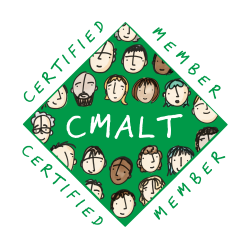 I’d had my eye on the programme for a number of years – it has a great reputation, but my circumstances hadn’t been quite right in previous years (maternity leave & then catching up from maternity leave). 2016 was my last opportunity as a PhD student, and I can confirm that its fantastic reputation is well deserved. It’s a very intense fortnight, but immensely intellectually rewarding, and enormous fun too (I don’t think I laughed so hard in the whole of 2016 as I did on ‘Bill Spectre’s Oxford Ghost Tour). The OIISDP is wonderful opportunity for anyone doing a PhD on a topic aligned with Internet Studies. As social media has permeated virtually every subject and sector to some extent, it’s quite common to be working in virtually any Department but studying a traditional topic through an Internet Research lens. I’m based in an Educational Technology department for example – which is online-focused and techie, but I don’t think anyone else attends the Association of Internet Researchers conference, for example. Applications for the 2017 OIISDP are currently open – apply at http://sdp.oii.ox.ac.uk/apply/ – closes 20th February. Good luck! This is something that I find myself checking over and again, so am jotting a quick blog post for my reference and because it’s probably something that would be handy for everyone. I’m not going to go into the pros and cons of the impact factor as a metric here – there are substantial cons, but it is something to be aware of. It’s hard to judge too as (i) Educational Research is a field which has generally fairly low impact factors (or none at all), and (ii) it changes over time – journals sometimes seem to pick their ‘best year’ and put that on their website as their impact factor even if it is a bit out of date. A website which I have found to be handy and interesting for reference is the Scimago Journal & Country Rank site (http://www.scimagojr.com/). It seems to be more extensive for Ed Tech than Web of Science, and provides a range of metrics. Edit: Another handy tool I have discovered is the Elsevier Journal Finder, at http://journalfinder.elsevier.com/. By entering a title and abstract, it will suggest suitable potential (Elsevier) journals. The output also provides a range of interesting metrics about the suggested journals, such as impact factor, and time to review.